First, heat some oil and fry t he curry paste.The trick in making nice curry is to fry the curry paste well to bring out the aroma. Don't be in a hurry to add everything inside. 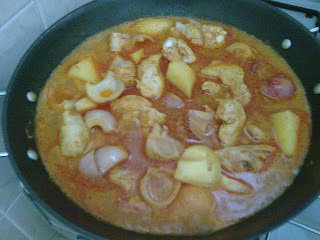 If you want the curry to look nicer, you can also fry the chilli paste separately to bring out the red colour, remove it add add it back when the curry is almost ready. 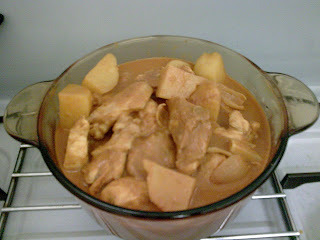 This version of curry chicken I made is slightly different from the usual one. 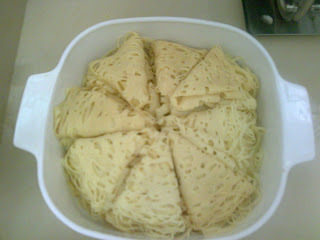 It is a bit sweeter and a bit sourish, less milky and more suitable for roti jala. 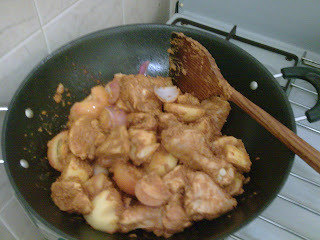 After the curry paste is fragrant, add the chicken pieces and mix well. The potatoes, tomatoes and onions can also be added. Add water gardually while stirring. Add enough water to cover all the ingredients. Add some tomato sauce, salt and sugar. Cover the kuali and simmer for 20 minutes, stirring every 5 minutes. Check the taste and add salt or suger according to your taste. The skill in cooking is not just following the recipe but knowing how much flavouring to add. This is where your taste buds come into the picture. 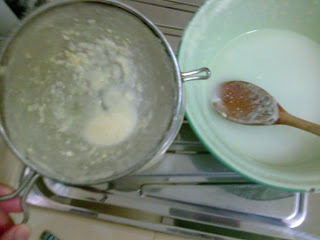 Just before simmering for 20 minutes, add the santan or milk. This will thicken the curry and give it a creamy feel. I do not like thick creamy curry, so this version is not so creamy diiferent from the usual taste. 1 and a half cups of water. 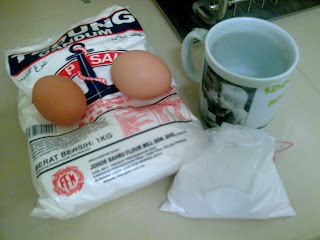 Mix the eggs and flour and add 1 cup of water to form a thick batter. 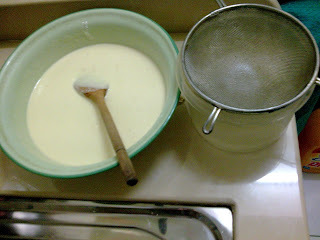 The batter needs to be seived so that the gluten and egg white strands won't clog up the roti jala dispenser. 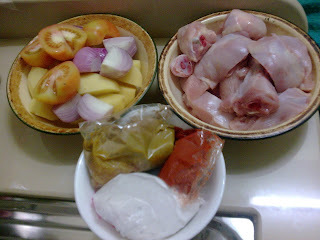 This will take some time so I usually do this before starting to cook the curry. Use the remaining half cup of water to pour into the seive to aid the seiving process. 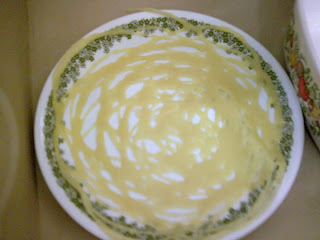 After the batter is seived, add a pinch of salt and some tumeric (kunyit) powder to give the roti a yellowish colour. Add the santan and mix well. To make the roti jala, you'll need a dispenser. This can be bought in supermarkets or markets. The bronze one is quite expensive, but the plastic one is very cheap about rm1. You'll also need a flat non-stick pan. 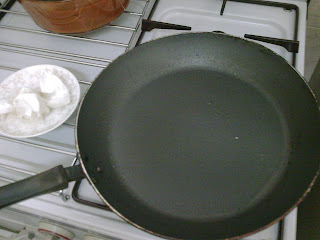 Heat the pan and oil the surface using a piece of cloth(or a paper towel) dipped in oil. 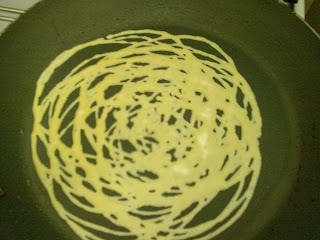 Pour some batter in the roti jala cup and make circular motion on the pan. You can try out various patterns and ways to do this. 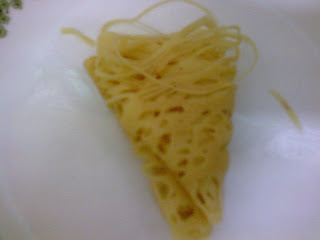 The speed you move and the height of the cup will determine the texture of the roti jala. This is where you have to figure out the best way to make nice roti jala. The first few pieces might be disastrous but once you can the hang of it, its quite simple. 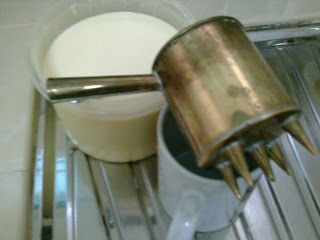 I usually let the batter cook until it is stiff enough for me to lift it on to a plate using a ladle of course. 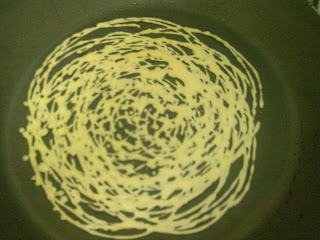 Then I'll pour the batter on the pan for the next piece. While the second piece is cooking, I'll fold the first piece into quaters. This way you save time. You don't need helpers if you plan your work. I made this curry chicken and roti jala all by myself in 2 hours, including all preparation like peeling poatoes, washing the chicken, seiving the flour. It is quite a lot of work and I'm quite lazy to do this wxcept for certain occasions like when my children come back for holidays.